President Donald Trump’s new war plan for the Islamic State is working well, said Defense Secretary Jim Mattis and Joint Chiefs Chairman Gen. Joseph Dunford. In their first joint appearance since Trump took office, the Pentagon leaders characterized ISIS as a shadow of its former self and doomed to lose all of its territory. They credited looser restrictions on generals and a shift to surround-and-annihilate tactics. Trump came into office this year pledging a new approach, promising to hit ISIS faster and harder, threatening to fire top U.S. commanders, and demanding a new war plan on his desk within 60 days. What’s new isn’t the strategy — the U.S. is still executing the Obama-era “by, with, through” approach in which direct assaults are conducted by local partner forces. But less than four months after Trump took office, Mattis said the operational and tactical difference has been clear. Mattis elaborated: “Two significant changes resulted from President Trump's review of our findings. First, he delegated authority to the right level to aggressively and in a timely manner move against enemy vulnerabilities. Secondly, he directed a tactical shift”: surround ISIS fighters, instead of just pushing them out of a given territory. In other words, “delegate and annihilate,” a senior U.S. military official said after Friday’s press conference. Brett McGurk, the U.S. diplomat in charge of managing the anti-ISIS coalition, pointed to the May 10 assault by U.S.-backed Syrian militias on Tabqa Dam, which holds back Syria’s largest reservoir. Mattis said that the rules of engagement remain the same. 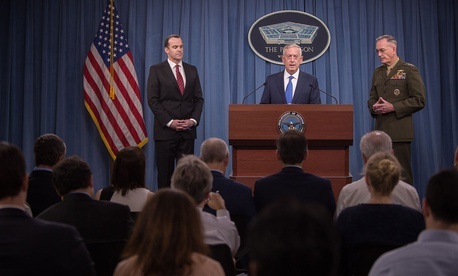 “There has been no change to our continued extraordinary efforts to avoid innocent civilian casualties, despite needing to go into populated areas,” he said. And American troops are still under instruction to halt at the last point of cover and concealment, letting local forces go in for the direct assault. U.S. advise-and-assist forces still end up in harm’s way. On May 5, Senior Chief Kyle Milliken — a Navy SEAL — was killed in Somalia in what the Defense Department characterized as combat alongside local forces. Mattis said that group came under assault and Milliken was killed in the ensuing battle. Milliken's memorial service was held Wednesday in Virginia.